Having a pool is a luxury in and of itself. It would be a shame to not use it for a significant portion of the year due to chillier temperatures. If you are looking to heat your pool, contact a trusted pool-heating serviceman at our company today for a free estimate! Pool heating systems not only allow you to use your pool in colder weather but they also make pool water more comfortable in the summer months as well! Choosing the right heater for your pool or spa can be complicated, so please call in order to discuss your unique situation. There are many options, all varying in price and ability; please continue to read to learn about these many options. It’s substantially cheaper to operate than a gas heater (see below). The electricity required to run a swimming pool heat pump typically costs only one third as much as propane to deliver the same heat, and only half the cost of natural gas. 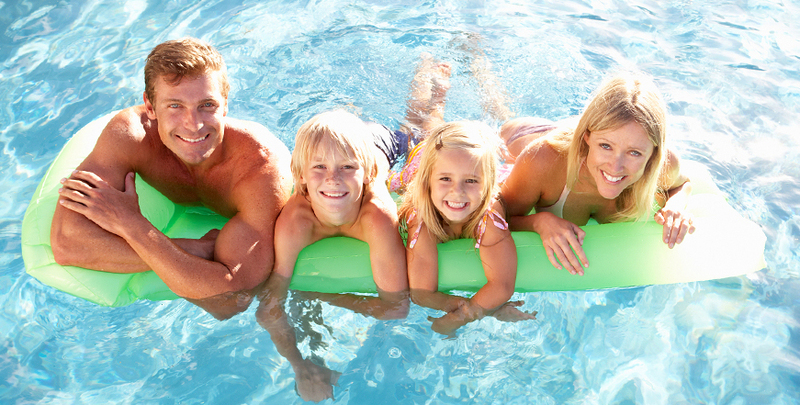 The Heat pump is the economical, safe and trouble free way to heat your pool. The great advantage of gas is the ability to maintain any temperature in pretty much any weather. As long as you are willing and able to pay. This might be important if you must use your pool for therapeutic exercise. Even so, with today’s high and rising fuel costs, we recommend that a gas heater be installed only as a backup system to supplement a primary solar pool heater or pool heat pump when 85–90°F pool water temperatures are medically required. Solar pool heating is a very mature technology; thousands of solar pool heaters have delivered trouble-free operation in Florida since the late 1970s. Unlike a propane or natural gas pool heater with metal parts, a quality solar pool heater will keep you swimming in a warm, comfortable pool for the next 15 to 20 years. All solar heating systems work on the same principle as a garden hose sitting out in the sun. The sun strikes the hose and the water inside is heated. Because the water temperatures required for swimming pool heating are relatively low, inexpensive but durable polypropylene plastic solar panels can be used for pool heating. However, because a swimming pool holds several thousand gallons of water, small temperature changes require large amounts of energy. So solar pool heating usually requires a large solar collector area: typically 80–100 percent of the swimming pool surface area. Solar pool heating is best for those pool owners seeking the most environmentally friendly heating solution. If you are interested in going “clean and green,” solar is the way to go.